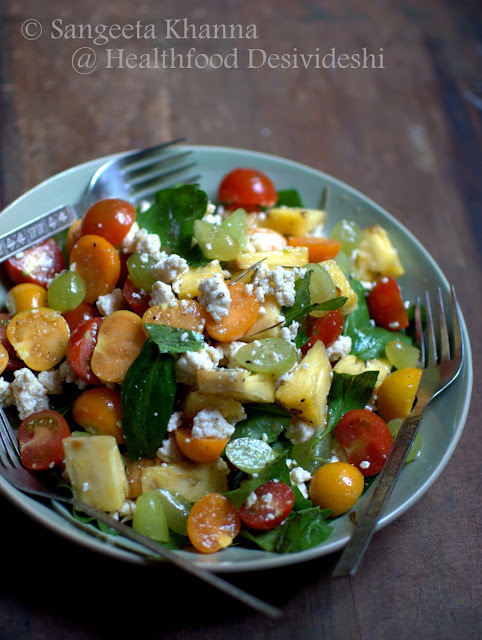 A fruity Insalata Caprese. Yes, when you are getting your most favorite fruits of the season you better use them differently for variation. 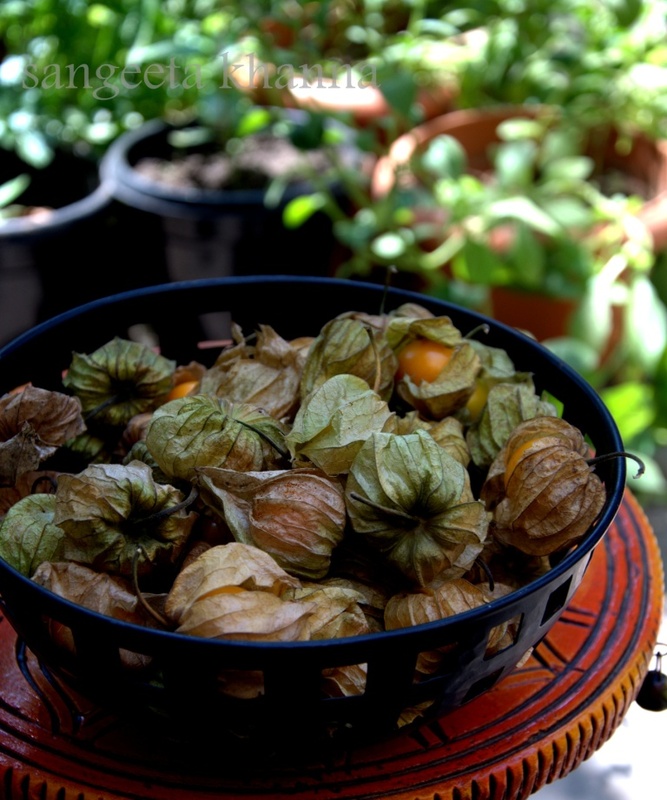 I do consume about 2 kilos of gorgeous Cape gooseberries and one whole large pineapple within a week sometimes. That too along with some strawberries and bananas thrown in during the week. Oh grapes too. I'll tell you how I made this salad for 4 days consecutively last week. Not to finish all the fruits but to experiment with different cheeses every time. I liked it with feta the most, the husband liked it with paneer the most. So it's not a true Insalata Caprese in any way but the inspiration comes from there of course. It has been long time I posted any of my salad meals. This one with a 4 day repetition in a row, urged me to be posted. As a therapeutic working lunch, this is the best thing you can do to yourself. 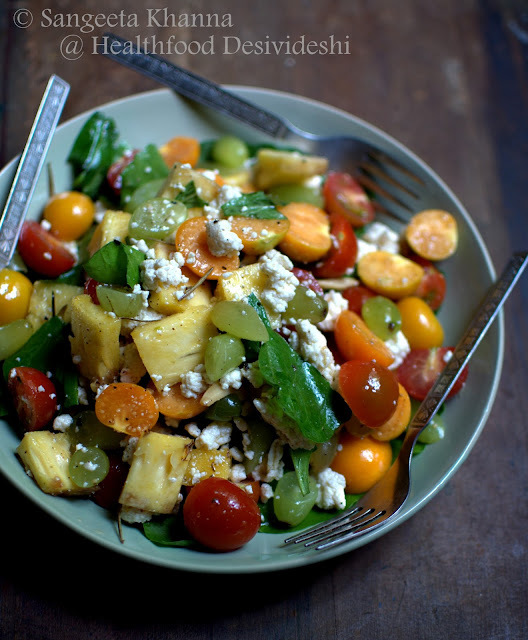 Chopping the fruits and tomatoes slowly, tearing Basil leaves and tossing up a salad like this a pure joy. A multi sensory experience. dressing, to be mixed in a separate bowl.. Mix the dressing and crumble the cheese into it. Toss and set aside. 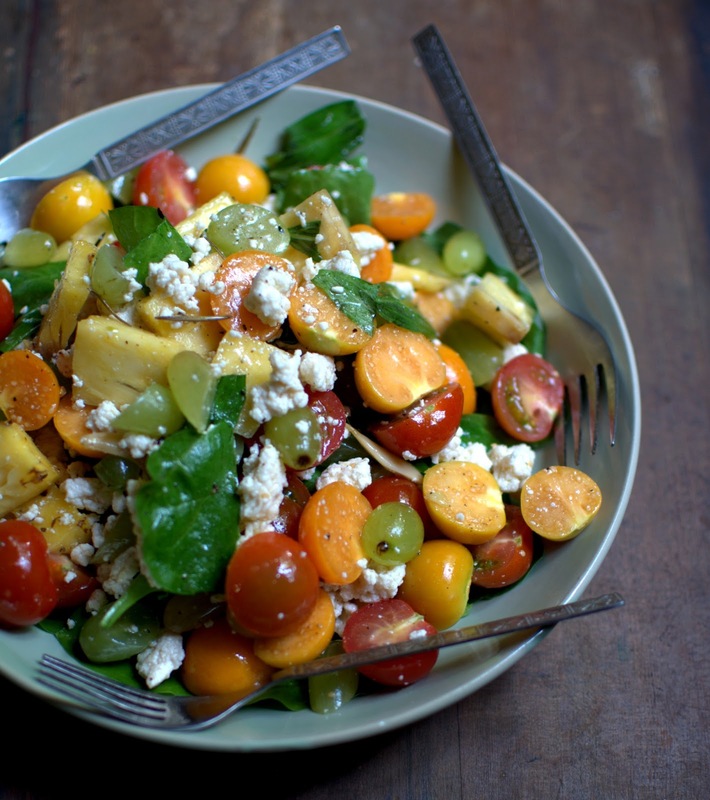 Chop all the fruits and tomatoes and toss them all the with the dressing and freshly hand torn basil. I added a few leaves of fresh spinach from garden too. Layer the plate with spinach leaves and pour the salad into this. Serve immediately. My lunches become exciting when I have some fresh fruits, cheese and herbs. This I eat on my work desk many times. I know it's not good and wont ever advise someone doing that, but it is inevitable sometimes. This salad perks up. I wonder why I don't do it more often. Make this salad I mean. May be because I want so many other things to try and eat too..what to do..
Love it, so colorful and tempting. Please do send your delicious and healthy dish to my "Healthy Me & Healthy Us" event @ my blog (read the rules please).